Tanzanite, the rare violet-blue form of the mineral zoisite, was first discovered in 1967 in Tanzania. East Africa remains the only source for this gem and though there is a lot of tanzanite in the market, the supply of high grade material is limited. The limited supply, combined with strong demand, has resulted in rising prices, sometimes as much as $1,000 per carat for top grade stones. 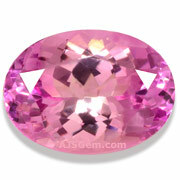 The very rare pink tanzanite can go much higher. Tanzanite is a gorgeous gem, but its tremendous popularity must be surprising to the miners who originally discovered it. In its natural state, tanzanite is typically a rather unappealing brown, and the violet blue is produced through low temperature heating. It is not an especially hard gem either. At 6.5 on the Mohs scale and with delicate cleavage, it is less durable than common quartz. 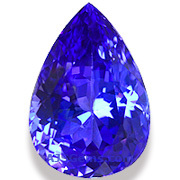 But the rich color of the best tanzanite is quite unique in the gemstone world, rivalled only by the finest (and much more expensive) blue sapphire. But not all tanzanite is especially valuable. The main determinants of tanzanite value, like all colored gems, are color, clarity, cut and carat weight. But in the case of tanzanite, color is so important that it outweighs almost all other considerations. Tanzanite is classified as a Type I gemstone by GIA, meaning that tanzanites are normally eye clean or better. So clarity is rarely a problem with tanzanite. But the color range can be quite wide, since tanzanite occurs in gold, green and violet as well as blue. The saturation is also highly variable, with some stones quite pale. In general we can say that a tanzanite is more valuable if the color is more blue than violet, and when the color is more saturated or intense. Though some buyers may prefer a more violet color, or a lighter tone, the deep blue tanzanites will sell at the highest prices in the market. 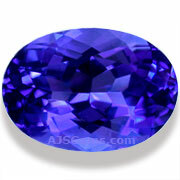 There are also other colors of tanzanite in the market, known as fancy color tanzanites. They include green, blue-green, golden, orange, pink and purple. These rare unheated tanzanites are graded according to the purity of color. Vivid fancies are very rare and coveted by collectors. This month we feature fine gemstones from East Africa, the gem-rich region running from Ethiopia in the north down through Kenya and Tanzania to Mozambique and Madagascar. 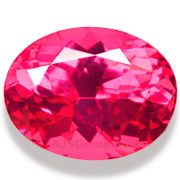 The vivid pink-red spinels from the Mahenge region of Tanzania are regarded by gem dealers as the finest in the world. They are prized for their intense color and a unique neon-like glow. Most of these very rare gems came from a single find in 2007. This hot pink 1.74 ct oval is a splendid example. Guaranteed natural and untreaed. A top grade tsavorite in a rich velvety chrome green. This is a well cut gem that displays full brilliance and fire. This fine tsavorite will make a stunning ring. Guaranteed natural and untreated. 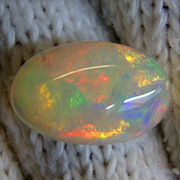 Traditionally the opal market has belonged to Australia, with more than 95% of the world's production. But a huge find of high quality opal in Welo province of Ethiopia is transforming the opal business. This 7 ct opal has very good translucency and excellent play of color, displaying the full range of colors from violet to green, yellow, orange and red. 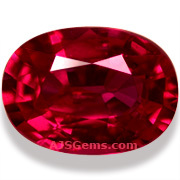 Virtually all rubies and sapphires have inclusions and a clarity grade of "eye clean" indicates a high quality gem. This 2.22 ct blue sapphire from Madagascar is the exception -- it has such exceptional clarity that we graded it "loupe clean." Combined with its rich royal blue color, this a superb value that will set up beautifully in your jrewelry design. Guaranteed natural. Mozambique has become an important source for ruby and the mines there have produced some very fine unheated stones in larger sizes. This 2.06 ct beauty is an excellent example with wonderful saturation and brilliance. Certified as unheated by GemRsearch Swisslab (GRS) with color notes as "vivid red." Richland Resources Limited of the UK have sold their 50% stake in TanzaniteOne, the world's largest miner of tanzanite. Richland ran TanzaniteOne in a joint venture with Tanzania's State Mining Company. The shares were purchased by Arusha-based Sky Associates Group, a firm reportedly owned by Hussein Gonga, Faisal Shahbhat and Ridhiwan Ullah. Richland's CEO, Bernard Olivier offered this explanation for the sale: “In Tanzania the safety situation, liabilities and changes in legislation relating to gemstone production have made Tanzanite mining extremely challenging for a public company such as ourselves." Zircon occurs naturally in a range of earth tones, ranging from golden to green, cinammon, orange, sherry and red. The blue zircon is produced by low temperature heating of brown zircon. But it turns out that only some brown zircon will turn a vivid blue when heated. Some of the Cambodian zircon can be heated to blue, and this is true also of the Burmese zircon. But thus far none of the Tanzanian zircon can be used to produce blues, so almost all of the blue zircon you will in the market is from the deposits in northeastern Cambodia. Iolite is actually quite a hard material, with a rating of 7 to 7.5 on the Mohs scale. That puts iolite in the same range as garnet and tourmaline. So it's suitable for any kind of jewelry, including rings.